Last Sunday, as has been their habit in recent years, the Cowboys contrived to lose a game they had seemed certain to win, as they gave up a late lead against the Lions to lose 31-30 in Detroit. 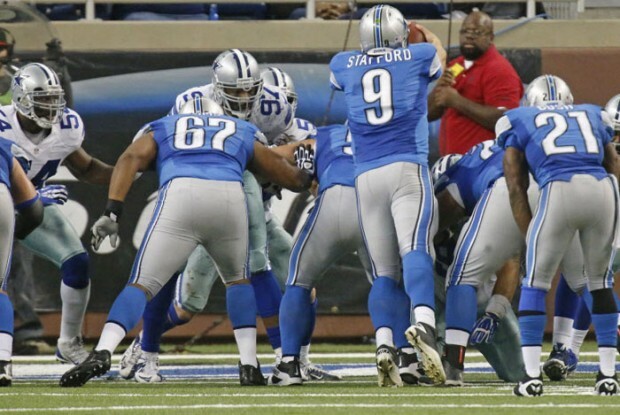 Matthew Stafford led the home team to victory in the final minute of play, as they trailed 30-24 before getting the ball back on their own twenty, but six plays later the Lions QB called a spike on the one yard line to stop the clock, which was to fake out the Dallas defense as he then dove over the line to break the plane of the end zone and score the winning touchdown. It was yet another gut wrenching loss for the Cowboys, but Detroit would not have ever been so close if the visitors had covered Calvin Johnson better, as the wide receiver racked up 329 receiving yards – second most ever in a single NFL game – plus a touchdown as the Dallas secondary seemed completely unable to stop him. All four of the defeats that the Cowboys have suffered thus far have been tough – they gave up ten unanswered fourth quarter points in San Diego to lose to the Chargers; like the Lions, the Chiefs beat them by just a single point; and the Broncos capitalized on a late Tony Romo interceptions in a game he was otherwise brilliant in, to win in Texas. Despite this relatively bitter start to 2013, Dallas still find themselves, at 4-4, with a one game lead in the NFC East, as the rest of their division has been floundering. To be fair, for most of their game in Denver last weekend, Washington appeared to be capable of an upset and they led 21-7 late in the third quarter. However, their offense went missing after that point and Peyton Manning led the Broncos to victory thanks to 38 unanswered points, with the veteran QB overcoming his own mistakes – he threw four interceptions and lost a fumble – to ensure Denver moved to 7-1 on the season. Even with that strong record, the Broncos remain one game behind the Kansas City Chiefs in the AFC West, who stayed unbeaten and moved to 8-0 on the year with a 23-17 victory over the Cleveland Browns, who started Jason Campbell at quarterback in favor of the struggling Brandon Wheeden. Back in the NFC East, on Monday of last week, the Giants were sitting at 0-6, but within six days they had moved to within two games of the division lead thanks to victories over the Vikings and Eagles, the latter coming thanks to five field goals in Philadelphia on Sunday, giving them a 15-7 victory. The Eagles have now lost their last ten games at home dating back to the 2012 campaign and once again had to replace the injured Michael Vick – the opening week praise their high-octane offense received now seems like a long time ago. The Packers remained top of the NFC North with a 44-31 victory in Minnesota on Sunday night, with the former Green Bay receiver, Greg Jennings, held to one catch for 9 yards against his former club, suggesting all his trash talk about Aaron Rodgers over the summer might be something he could want to re-think. In the second game to be played in London this season, the Jacksonville Jaguars remained perfectly inept, as they were beaten 42-10 by the San Francisco 49ers at Wembley Stadium; while the Buccaneers kept up their own winless start to 2013, as they lost at home on Thursday night, 32-13 against the Carolina Panthers. The state of Florida is not having much luck at the moment, as Tampa Bay and Jacksonville are joined on their losing runs by Miami, who have gone from 3-0 to 3-5 with their latest defeat being at the hands of the Patriots, despite the Dolphins having held a 17-3 half-time lead. Elsewhere, the Saints came off their bye week to beat the Bills, 35-17 in New Orleans; Seattle remained top of the NFC West thanks to a hard-fought 14-9 win in St. Louis on Monday night; the Cardinals all but ended the postseason hopes of the Falcons, with a 27-13 victory in Arizona; Oakland defeated Pittsburgh 21-18 on the back of a 93 yard touchdown run by Terrelle Pryor on the first down after the opening kickoff; and the Bengals thrashed the Jets, 49-9 in Cincinnati. This weekend marks the half way point of the regular season, so it is a good time to look back on the playoff predictions I made at the start of the year to check in with how they are going. The Good: Packers look like being NFC North champions – though the Lions have a very easy looking schedule for the rest of the way; the 49ers and Saints both look like making the playoffs, but their positions might be flipped as the Saints could be a two-seed behind Seattle. 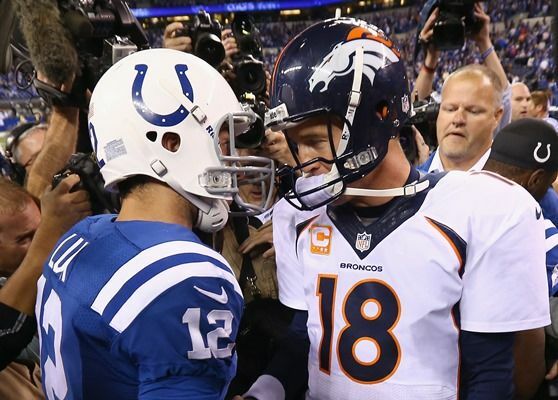 On his return to Indianapolis – a city where he had played for thirteen years – Peyton Manning could not lead the Broncos to a win over his old franchise, as the Colts became the first team to defeat the Broncos in the 2013 season, beating them by a 39-33 scoreline. It was Manning’s replacement in Indianapolis, Andrew Luck, who had the better performance of the two quarterbacks, throwing three touchdown passes, while his opposite number also threw for three scores, but also gave up an interception as well as a fumble in the endzone that resulted in a safety. Although the defeat marks the first time that the Broncos had lost in the regular season since Week 5 of 2012, it again calls into question Peyton Manning’s ability to win the big games: in his career, he has a 159-71 record in the regular season, but a 9-11 mark in the postseason and his teams have gone out in their first playoff game on eight separate occasions. Denver’s start to this season has been impressive and their offense has been scoring at a record rate, but their six wins have come against teams who have a total of 13 wins between them (Dallas 4; Baltimore 3; Philadelphia 3; Oakland 2; NY Giants 1; Jacksonville 0), while the Colts’ five victories have included successes over the 5-2 49ers and the 6-1 Broncos and Seahawks. If they cannot usurp the Kansas City Chiefs – who are now the only unbeaten side after they sneaked past the Houston Texans, 17-16 – in the AFC West, then they could find themselves as the number 5 seed in the playoffs and back in Indianapolis for a postseason game – if that happens, do not be surprised if Andrew Luck can once again outperform the man he replaced. Last Sunday turned out to be a great day for Boston sporting fans*, as the Red Sox had a late comeback win against the Detroit Tigers in the American League Conference Series – fueled by a grand slam by David Ortiz – hours after the New England Patriots had pulled off a similarly shocking victory over the New Orleans Saints, after they had trailed by four late in the game. Tom Brady, who had been held without a touchdown pass for the first time in 52 games the week before, had been misfiring for the majority of the game, but a perfect throw with just five seconds remaining found Kenbrell Tompkins at the back of the endzone to lift the Patriots to a 30-27 win over the previously unbeaten Saints. New Orleans only had themselves to blame, as they had seven offensive snaps with less than three minutes to go in the fourth quarter, yet were unable to hold on to the 27-23 lead they held at the time. *Something that, as a Yankees fan, it gives me no pleasure to say. That defeat for the Saints means that there are only two undefeated teams remaining in the NFL in 2013, both of whom are in the AFC West: the Denver Broncos, who made harder work of beating the Jaguars than many expected (myself included), but eventually prevailed 35-19, though only after Jacksonville had pulled within two at the half following an interception return against Peyton Manning; and the Kansas City Chiefs, who beat their divisional rivals, the Oakland Raiders, 24-7 in Missouri. At the other end of the spectrum, two other teams remain winless with the Jaguars: the New York Giants, who fell to 0-6 with 27-21 loss to the Bears in Chicago on Thursday night; and the Buccaneers, who lost 31-20 to the Eagles, despite Philadelphia being forced to play their reserve quarterback, Nick Folk, as Michael Vick was out through injury. Pittsburgh managed to avoid joining the group of franchises without a win heading into week 7, as they beat the New York Jets, 19-6 at the MetLife Stadium in New Jersey, but the Steelers remain rooted to the bottom of the AFC North, below the Bengals, who improved to 4-2 with an overtime victory over the Bills in Cincinnati; as well as the Ravens and Browns, who both dropped to 3-3 following defeats against the Packers and Lions respectively. Elsewhere, the Cowboys gained a share of the lead with Philadelphia in the NFC East, after they beat Washington in Dallas, 31-16 on Sunday night; the Colts had a surprise loss in San Diego, as they were beaten 19-9 by the Chargers; the 49ers remained a game behind the Seahawks, as they beat their divisional rivals Arizona in San Francisco, while Seattle overcame a fluffed field goal attempt that was returned for a touchdown by Tennessee, to overcome the Titans 20-13; and some Houston Texans “fans” cheered when their quarterback, Matt Schaub, was injured against the Rams, a game the home side ended up losing 38-13. The other game last Sunday saw the Carolina Panthers beat the Vikings 35-10, but that game was overshadowed by the tragic news that a 2-year-old son of Adrian Peterson, the Minnesota running back, died from injuries he had sustained while at home in South Dakota, with the boyfriend of the boy’s mother now charged with aggravated assault on an infant, with more charges likely to be filed shortly. Even though I do not agree with the death penalty, as a Dad to a 2-year-old, if I was on that jury there would not be enough bailiffs in the world who could stop me from getting to the defendant if the evidence proved he was guilty of such a heinous crime. Despite their loss, the Saints remain in top position as the two teams that are undefeated – Denver and Kansas City – both have beaten the Jaguars and Giants, two winless teams. Both the Chiefs and Broncos could usurp New Orleans – who have a bye – this weekend, if they can beat the Texans and Colts respectively. The Jaguars lost by 16 against Denver but moved up three places in the rankings as the standard of their opponents was once again higher than that of the Giants, Buccaneers and even Pittsburgh, who remain below Jacksonville despite having won a game. To further explain this, the four teams that Pittsburgh have lost to (Minnesota, Tennessee, Cincinnati and Chicago) have been beaten a total of 11 times in their other fixtures; while the six franchises who have beaten Jacksonville in 2013 (Kansas City, Denver, Indianapolis, Seattle, Oakland and St. Louis) have a total of 10 losses between them. The Jaguars are almost definitely worse than the Steelers, but it will take at least another week of results for my power poll to reflect this. As the season progresses and the amount of data available increases, these rankings should become more reliable in working out who is good and who is not, as every week the relevance of each victory or loss is adjusted. For example, Miami’s win over the Colts is slightly less impressive now that the Chargers managed to beat them as well, something that is reflected in the fact that the idle Dolphins fell from 5th to 8th in this week’s poll. 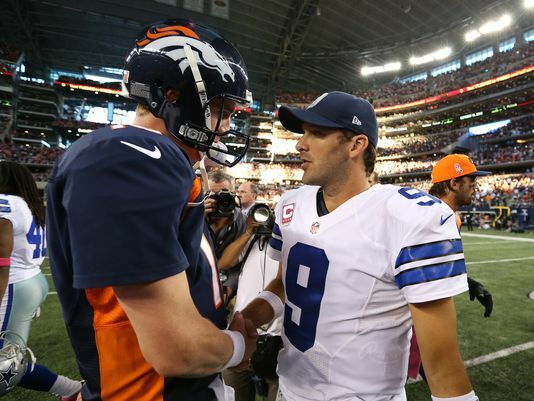 Last weekend in the NFL, the Denver Broncos extended their run of regular season victories to 16 straight, dating back to Week 6 of the 2012 campaign, as they came from behind to win a high-scoring contest in Dallas, 51-48. For the home team, Tony Romo became the first Cowboys quarterback to throw for over 500 yards in a game and he had five touchdown passes, but unfortunately for him the main thing that will be remembered is an interception he gave up in the final two minutes, which allowed Denver to move into field goal position, with Matt Prater converting the winning kick as time expired. The intercepted pass was brilliantly caught by the Broncos linebacker, Danny Trevathan, but it provided further fodder for those who do not believe that Romo, no matter how well he has been playing up to that point, can continue to perform when the pressure is on. For Denver, Peyton Manning continued his incredible record-setting pace to start the season as he threw four touchdown passes – giving him 20 in his first five outings in 2013 – and is still yet to throw an interception, while his offense has racked up 230 point, the most ever over the opening five weeks of an NFL season. Alongside the Broncos, two other teams are 5-0 this campaign following victories last Sunday – the Chiefs defeated the Titans. who were without their first choice quarterback, Jake Locker, 25-17, with Locker’s replacement, Ryan Fitzpatrick, giving up two interceptions; and New Orleans won in Chicago, 26-18. The loss for the Bears allowed Green Bay to close to within a half game of both them and Detroit at the top of the NFC North, as they beat the Calvin Johnson-less Lions 22-9 in Wisconsin – extending their home winning streak over their divisional rivals to 22 consecutive seasons. One of the most impressive victories on Sunday was secured by the Colts, who inflicted the first loss of 2013 on the Seahawks with a 34-28 success in Indianapolis, as Andrew Luck rallied his team from an early 12-0 deficit. Also in the AFC South, the Texans mustered only a field goal in their 34-3 defeat in San Francisco; while the Jaguars continued their quest towards 0-16 with a 34-20 loss in St. Louis. Three teams are tied at the top of the AFC North with 3-2 records – with only the Steelers not joining the party, who remain on 0-4 following their bye week – as the Ravens edged the Dolphins in Miami, 26-23; Cincinnati prevented Tom Brady from throwing a touchdown pass, the first team to do so in 52 games, as they beat the Patriots 13-6; and the Browns won on Thursday night in Cleveland against the Bills, 37-24, in a game that saw both sides lose their starting quarterbacks – Brandon Wheeden and EJ Manuel – to injuries. Elsewhere, the Raiders had to play their game against the Chargers late on Sunday evening, because their stadium had to be converted into a football setup following the previous day’s Athletics fixtures in the MLB playoffs, but the delay was worth it for Oakland who triumphed, 27-17; Arizona’s defense held Carolina to just 6 points as the Cardinals prevails 22-6; and Philadelphia were the victors in the meeting of two teams from the worst division in the league, the NFC East, as the Eagles beat the Giants, 36-21. Also, during their bye week, Tampa Bay cut their starting quarterback, Josh Freeman and he was later picked up by the Minnesota Vikings, though he is not expected to start this weekend. 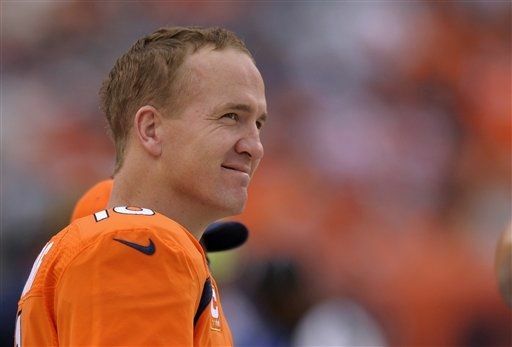 Peyton Manning got to sit out the final quarter of the Broncos’ rout of the Eagles. Merely a quarter of the way through the NFL season, almost everybody seems ready to pencil in the Denver Broncos and Seattle Seahawks as the teams who will be competing in next February’s Super Bowl, with Peyton Manning’s team being hailed as an offensive juggernaut that looks unstoppable. Last weekend, Denver racked up a franchise record 52 points in a fast-paced meeting with the Philadelphia Eagles, as Manning threw four touchdown passes and got to sit out the entire fourth quarter with the game already well beyond doubt. Meanwhile, the Seahawks had a much tougher time claiming the win in Houston, as they had to come from 20-3 down at the half to win 23-20 in overtime. The biggest play for the Seahawks – who moved to 4-0 for the first time in their history – was a 58 yard interception return by Richard Sherman in the final three minutes to tie the game and that helped cover up a poor throwing day for Russell Wilson, who had only 123 passing yards, no touchdowns and an interception. Although both Denver and the Seahawks appear to be the class of the league at the moment, history shows that early season form does not necessarily mean that a team will be going all the way in the playoffs. In 2007, the Patriots aced the regular season, going 16-0, but then lost in the Super Bowl to the New York Giants; and, at this stage last year, the Cardinals were 4-0 and only gained one more win all season, while the best teams in the league appeared to be Atlanta and Houston, both of whom crashed out in the playoffs. My guess is that neither the Broncos or Seattle ends up playing in the big game in New Jersey next February and it probably is worth playing the rest of the fixtures before then rather than just picking the Super Bowl teams after only four weeks. There are three other teams who are currently unbeaten: the Kansas City Chiefs, who beat the hapless New York Giants, 31-7 last weekend; the New England Patriots, who had an impressive 30-23 victory in Atlanta; and the New Orleans Saints, as they beat the Dolphins, who also went into the game with a 3-0 record, 38-17 on Monday Night. Alongside the Giants, there are three other franchises who have lost all four of their opening games; the Pittsburgh Steelers, who lost the first of two games to be played at Wembley this season against the previously winless Vikings, 34-27; Tampa Bay, who have benched their starting quarterback, Josh Freeman, led 10-0 going into the fourth quarter against Arizona, but gave up 13 unanswered points to the Cardinals; and the Jacksonville Jaguars, who continued to look like an all-time terrible team with a 37-3 home loss against the Colts. In the wretched NFC East, the Cowboys joined the Eagles and Giants in losing in Week 4, as they were kept off the scoreboard in the second half by San Diego, who came from behind to win 30-21; but Washington finally got a win, beating the Raiders in Oakland, 24-14, though the home team was forced to play Matt Flynn at quarterback, as their first-choice, Terrell Pryor, was out after suffering a concussion in their previous game against Denver. In the AFC North, the Browns took a share of first place by beating the Bengals in Cleveland, 17-6; while the Ravens fell 23-20 in Buffalo, as the Bills intercepted last year’s Super Bowl MVP, Joe Flacco, five times. On Thursday night, the 49ers overpowered the Rams, 38-11; while the other two games last weekend saw the Bears lose for the first time in 2013, 40-32 against their divisional rivals, the Lions, though that scoreline flattered Chicago, who scored two touchdowns in the final four minutes with two point conversions to make it look closer than it was; and the Titans beat the Jets, 38-13, but lost their starting quarterback, Jake Locker, to injury and will have to start Ryan Fitzpatrick until he is healthy again. The Week 5 slate starts on Thursday night with Cleveland having the chance to move clear at the top of their division as they host the Bills; then on Sunday, the Packers and Panthers come off their bye weeks to play the Lions and Cardinals respectively; Chicago host the perfect Saints; Fitzpatrick’s first start for Tennessee will be against the 4-0 Chiefs; and the Seahawks are in Indianapolis. Baltimore has a road game against the Dolphins; Dallas have the task of attempting to tame the Broncos; Houston travel to San Francisco; Oakland host their AFC West rivals San Diego; one team in the NFC East is likely to get a win as the Eagles play the Giants; St. Louis gets the chance to rack up some points as they entertain the Jaguars; and the Bengals and Patriots meet in Cincinnati. On Monday night, the New York Jets are in Atlanta to play the Falcons, who have started the season 1-3 and badly need to win if they are to have any chance of contending to make their fourth consecutive playoff appearance. The teams who have a bye week are Tampa Bay, Washington, and the two teams who played in London last Sunday, Minnesota and Pittsburgh. Last weekend in the Premiership, although both Manchester clubs suffered defeats in games they were expected to win, it was the red half of town that should feel most concerned about their team’s chances this season following United’s 2-1 home loss against West Brom. It was the first time that Albion had beaten United in the Premier League and what was surprising about the result was not necessarily that the away side came away with all three points, but that they fully deserved to do so having been the better team for the majority of the game and the scoreline did not flatter them. 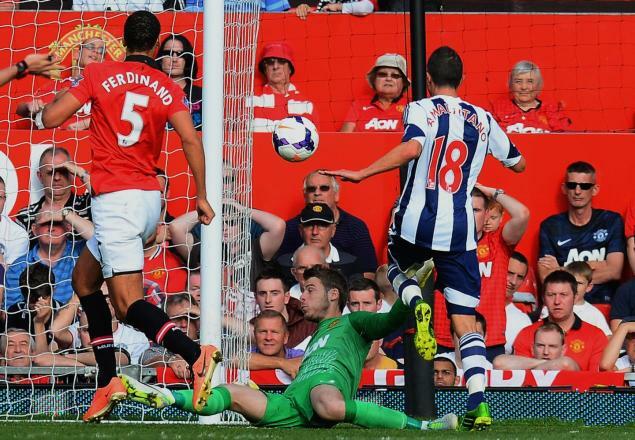 In particular, West Brom’s two goals were eye-catching, the first a fantastic solo run by Morgan Amalfitano – who ran from inside his own half, nutmegged Rio Ferdinand, then faked David de Gea before lifting the ball over him and into the net; the second was a classy team move finished with a strike by Saido Beharino from just outside the area. Manchester United had equalized through a Wayne Rooney free-kick, which was more luck than judgement as the ball evaded everyone on its way to bouncing into the goal untouched, but the home supporters – who clapped Albion off the pitch in recognition of their good performance – should be worried about how their side is looking under the management of Moyes. 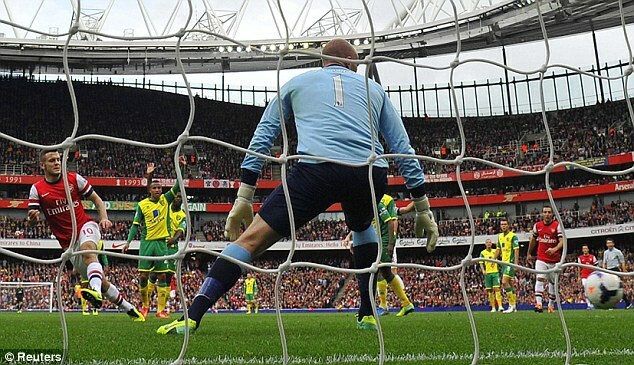 So far this season in the league, they have beaten Swansea and Crystal Palace, drawn at home with Chelsea, and lost to West Brom, Liverpool and Manchester City; which means for only the second time in the Premiership era, the reigning champions have lost three of their opening six matches (the other team to do that was Blackburn in 1995/6). United have problems all over the pitch: in defense, they are constantly exposed by the faltering form of the aging Rio Ferdinand; in midfield, they have nobody to win the ball with a crunching tackle and neither Maurone Fellaini – who is better off deployed in a more forward position as Moyes did at Everton last year – nor Anderson are the answer to sit in front of the back four; while up front, they have failed to score from open play since the first day of the season, with their four goals since then coming from three Wayne Rooney free-kicks and a penalty (that should not have been awarded against Crystal Palace) by Robin Van Persie. On current form, not only do their reigning champions seem unlikely to even be in the title conversation this season, they do not look strong enough to be in competition for a top four place either. With only seven points from six games, United are above Newcastle – who are 16th in the table – merely on goal difference and they are as many points behind Hull in 8th as they are ahead of Fulham in 18th.